Truth be told, I spent much of this week "harvesting" images from magazines for my collages. I came into a slew of National Geographics and Smithsonians recently, and sometimes there's nothing I like better than paging through magazines, cutting out photos, and listening to Wayne Dyer CDs! 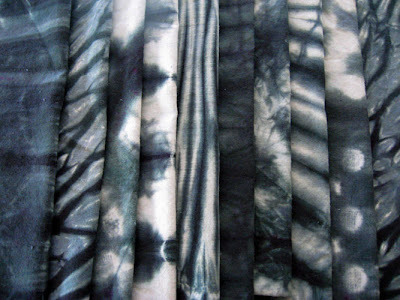 At the end of the day, though, I laid out my next quilt, the first of several "black" shibori quilts. I've been thinking recently about whether there's an overriding theme to my quilting, an organizing principle, if you will. And there is -- the fabric itself dictates the piece. I'm more intrigued with the pattern and design of the cloth I've created, and what I can do with that, than with representing anything pictorial. This isn't really news to me -- in fact, I use similar wording in my artist statement. It's more confirmation to me that I am following what I'm inspired by, doing what I say I'm doing, applying my own unique take to the artform. For a while now I've been wrestling with the best strategy for quilt storage in my small studio, and I finally got it. Bed & Bath now sells clips for those slimline non-slip hangers and they're perfect for hanging quilts. After investing in several 8-foot lengths of pipe insulation and rolling quilts on that, I found that I don't like that method of storage. And I don't have a bed or other soft flat surface to stack quilts on. These hangers are perfect, and the soft clips don't make indentations in the fabric. I had a call today from a gal I never met before, who saw my solo show this morning in Eureka. She was really excited about my work and the printing and dyeing I'm doing. She'd just been to a workshop in the Bay Area and wants to learn much more about creating fabric, and she urged me to teach classes. So I'm thinking about that now, for the local market, and will research possible workshop venues in the next few weeks. Her call was a real boost for me, at the end of a lull-type week! 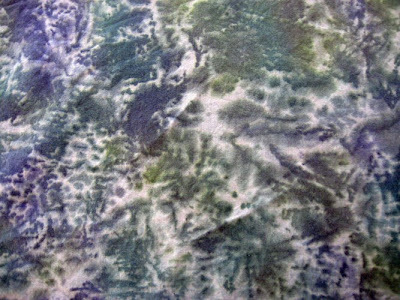 This is a recent dye printed fabric, photo of which has been sitting in my New Uploads folder along with several others...I'll upload those tomorrow. But I hate to do a post without something visual, so I'm sharing this one today. 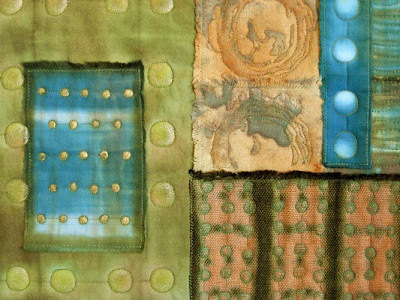 First off, I've put some of my small art quilts on sale at 25% off the original price...and I'm continuing the 30% off sale on my remaining stock of handwoven and handpainted wearable art. All items are list in a new "On Sale Now" section of my Etsy Shop, which you can view here. The prices have already been reduced, so just go ahead and purchase through Etsy as you normally do. 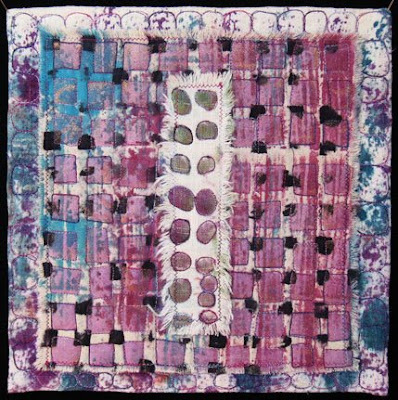 I've also recently joined Artbreak, an international online venue for artists, and I'll be using that site for just my medium- and larger-sized art quilts. There's amazing work on Artbreak. Once you check out my work, look at some of the other artists' vast creativity. I think you'll like it. It's great to see contemporary art from around the world! Lots of new stuff to share this evening. First, here's my weekly quilt, 31/52.2009 ~ Forest Light. It was kind of a scrap piece, with leftovers and odd bits. The honeycomb vertical piece is a strip of handwoven cotton and tencel. 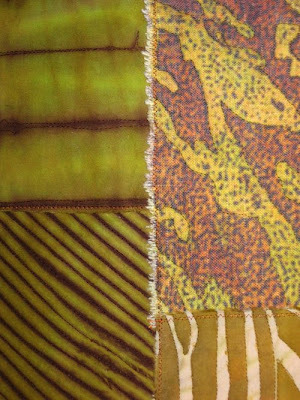 This was one of several samples I wove in the Woven Shibori class I took several years ago, fabrics that I've been using in quilts recently (see Lunar Influences for more use of handwovens). Back when they were woven, they were dyed with natural dyes that weren't lightfast, unfortunately. So I overdyed them, stamped on them, etc. The fabric in the upper left with the large color areas is cotton flannel. I had about a yard that was LWI dyed recently. 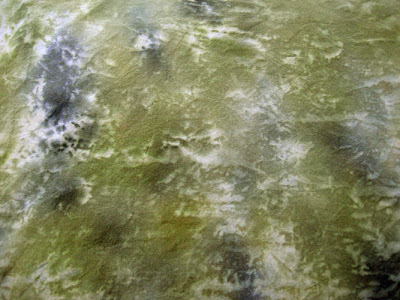 Flannel is really lovely fabric to work with ~ it dyes magnificently, is really soft, and quilts well. I recommend it if you haven't tried it yet. 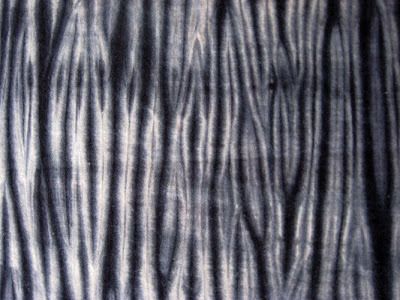 Here's black shibori batch number three. I used Procion MX #44. It looks really similar to batch two, on which I used Procion MX #300, but the #44 is just slightly purpler. Last night I had a couple of great ideas for using these black shiboried fabrics, so today I did my fourth black batch, this time with Cibacron Rich Black #F61. 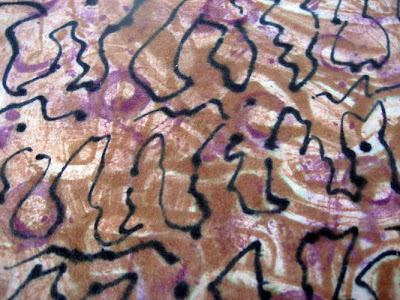 I actually shiboried with this black dye a while ago but thought perhaps I'd made a mistake -- because the white pattern areas turned out pink! 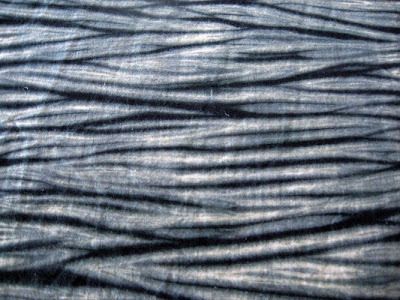 Well, it happened again today and now I realize that this particular black dye, although great for overall dyeing (I had a pair of Scotty's jeans in the pot and they turned out beautifully), it's not to be used for shibori. 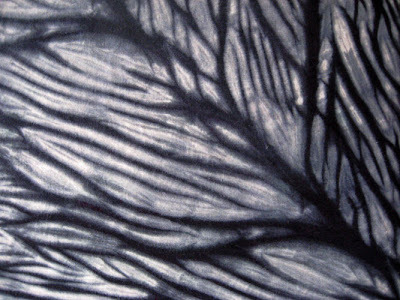 One of the Procion black dyes, #250, specifically says it shouldn't be used for shibori, although it gives a deep black in full immersion, and I suspect this is the same dye as the Cibacron Rich Black. Well, black and pink isn't so terrible, if you're into the 1950's, poodle skirts, T-Birds, and all that, but since the black in these shibori pieces is really more of a navy blue...in short, the fabric is pretty icky looking. I think Scotty just got more custom dyed RAGS for work! 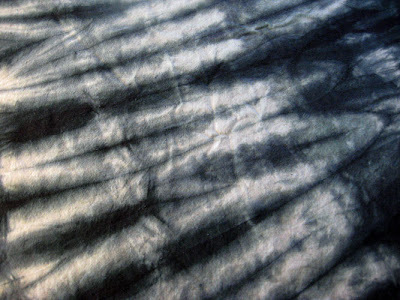 Thought I'd better upload these photos from the second black shibori batch I did last week, before I do the third batch today! The black used in these photos is Procion #300. This black is bluer than the first batch (Procion #39). Quite a bit of purple washed out in the final rinse, leaving blue-turquoise edges. Lovely! The first piece above -- can you tell what I used as the resist? The piece below was wrapped on a piece of very thick poly rope. Third piece below is bomaki arashi ~ sew the long edges of the fabric together and fit over a pipe, scrunch down, hold the edges with rubber bands or thin fabric strips tied very tightly, and dye. Anyhow, back to the studio! 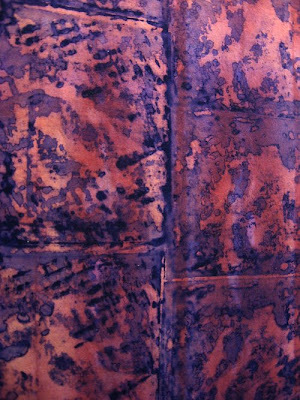 A new friend from North Carolina, Irene Munroe, contacted me recently because she was taken with my rust dyeing from about a year ago. Once I saw Irene's photos, I knew instantly who the true master was -- and it wasn't me! Following Irene's recipe, I did this piece last week. All photos here are from different areas on the same half yard of muslin. 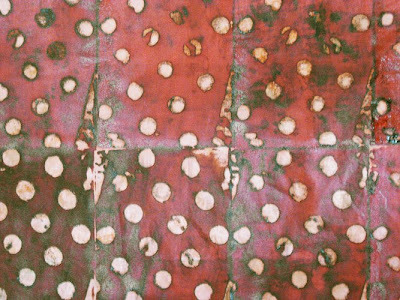 The key to getting outrageous prints from rusting is this ~ soak your fabric in 50/50 vinegar and water, til the fabric is really wet. Wring out as little as possible. Wrap the fabric entirely around a rusted object, over and over again until you've got a neat little package that's really wet. Wrap this in clear plastic, a baggie if it'll fit, then wrap that in another piece of clear plastic. Let "cook" for 4 or 5 days. Unwrap, wash out in cold water, then wash in hot water with synthrapol. I haven't figured out how to do this, yet, with a very large rusted thing. But maybe it's not necessary to have big objects when you can get full coverage on a piece of fabric with this method. If you're interested in seeing Irene's photos, email me and I will put you in touch with her. She doesn't have a web presence and I'd prefer not to list her email here. But I'm sure she'd be glad to share her work with you! On Wednesday I painted a bunch of fat quarters, with the intention that they be background fabrics for further printing -- deconstructed screen printing or otherwise. These are some of my results, and a few of these I will likely use as they are instead of doing further layers on them -- at least that's my thinking for now. All these were done with pre-soda soaked fabric, which is how I like to work when I paint or print. The second piece, just below, was the blotting fabric for the one on top. I like doing this a lot -- if you get the painted fabric wet enough and lay another piece on top, then let them dry like that, you get the most interesting textures on the top sheet! I found it very easy to replicate low-water immersion effects by simply scrunching up the fabric and holding in my hand, and dabbing on dye wherever. Then just open it up and let it dry like that. 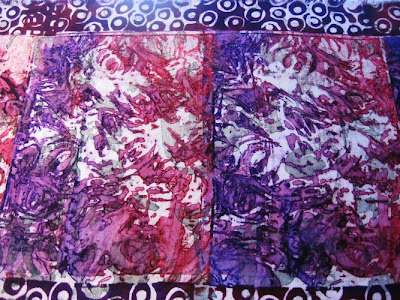 The fourth piece was another blotting fabric, I liked it much better than the piece it was laying on! 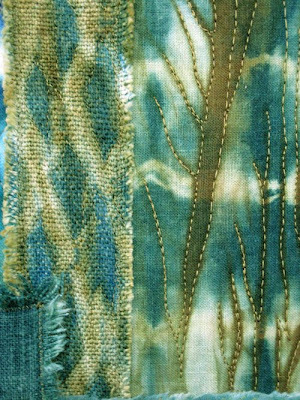 And the last piece is my favorite -- of non-blotter fabrics. I won't get to the studio until later today, and I've got another batch of fabrics to steam. This bunch was printed on yesterday, several were fat quarters dyed on Wednesday. Yesterday I mostly monoprinted on those fabrics, working out my technique for getting good monoprints using thickened dye instead of fabric paint. I'll upload photos in a day or two. I also have a rusted piece to finish off. I haven't rusted in close to a year, but a friend shared her technique and I've been anxious to try it again. I already know the result is far better than anything I've ever achieved before with rusting. So look for that early next week! I love the quilt naming process...sometimes I have a name as soon as I begin a quilt, like the one I posted yesterday, Wild At Heart. 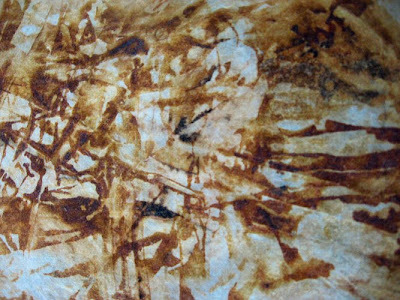 Sometimes nothing jumps out at me and I have to meditate on the piece until a name reveals itself. So the name for this week's quilt, 30/52.2009, just came to me ~ Mindscape. It kind of looks like what I imagine the inside of my head might look like, at least the physical part. Anyway, what's in a name? 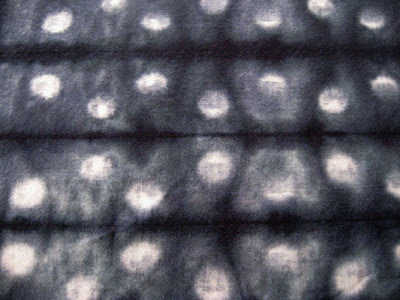 Great day in the studio today ~ I made this quilt, plus did a big batch of shibori, with a second black dye. That was about nine hours of work all together. I always wish I could do even more! Think I'll sign off...I'm tired and I'm spacing out! My latest quilt, finished today -- Wild At Heart. Finished size is 23 x 20. This one went really quickly and was very enjoyable to make -- nice soft fabrics! Mostly cotton, with a bit of rayon in the digital image, and a piece of raw silk at the bottom. 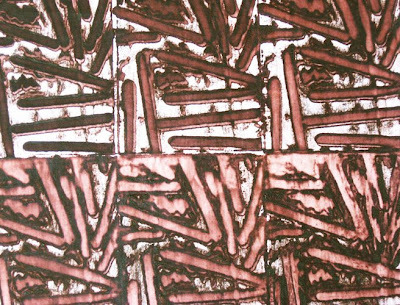 The digital image was a section of a photo I took of a handcut stamp on paper, that was heavily manipulated in Photoshop. Most of the other fabrics were shiboried, and I've also got a stencil print, two different prints with glue gel screens, and a deconstructed print. The photos of my paint dyeing session on Tuesday are ready to upload, but I'm going to do that tomorrow. All in all, today was another really great day in the studio...despite the fact that the weather in my neck of the woods has been crappy all week. Overcast, cold, damp. Arrrgggghhh -- summer on the North Coast! 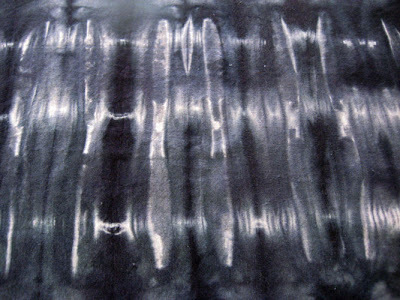 I did the first of four black shibori batches today -- this one with Procion MX Black #39. This black has a slightly greenish cast, a bit more so than shows up in the photos. 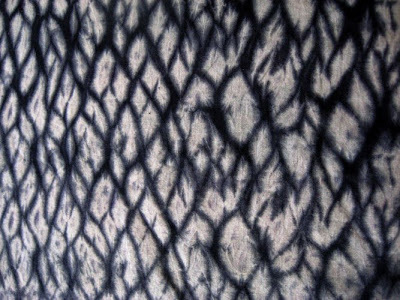 As I mentioned yesterday, I'm planning a quilt -- or a series of quilts -- utilizing shiboried black fabrics. My original thought was to combine fabrics from all four batches in one piece, although that may change, depending on the fabrics and how they look together. I'll be doing the second batch in the next few days. I also designed my next quilt today, stitched the top together and hand basted the whole thing. I'm quite happy with it, can't wait to see it completed. 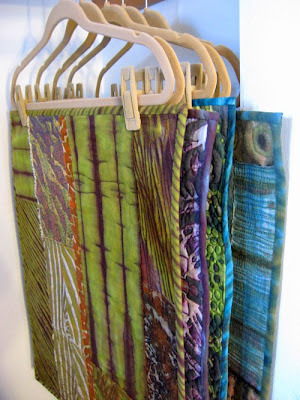 The fabrics -- shiboried, printed, and digitized -- had been on my design wall for several weeks. 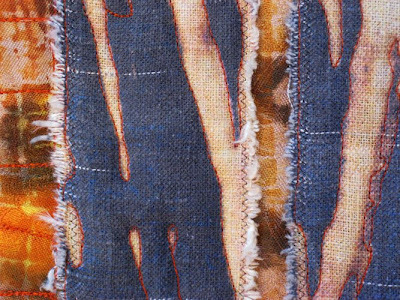 I'm finding that the way I create a piece is to preview fabrics on the design wall first, and look at them for a few weeks. Then I take them down, decide on how big the finished quilt will be, and start ripping and arranging fabric pieces on my work table. I had great fun doing this today. 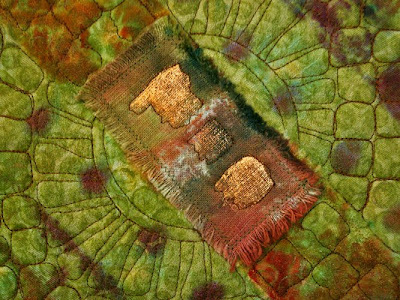 Taking a studio vacation tomorrow, so I can attend the Redwood Empire Quilt Guild show in Eureka. See you Monday! This week's quilt, just complete...29/52.2009 ~ Raspberry Shortcake. I just now decided on calling it that -- that was one name I had in mind, along with Raspberry Sundae, Berry Parfait and Raspberry Sherbet. Obviously, I've had delicious summer treats on my mind all day! The fabrics are printed and stamped cotton/rayon and linen. Ooh, remember Creamsicles by Good Humor? I think Creamsicles were the raspberry sherbet and vanilla ice cream on-a-stick treats, and Dreamsicles were orange sherbet and vanilla ice cream. Maybe it was the other way around. They certainly were delicious. Honk if you remember those! I'll be in the studio tomorrow, for sure. 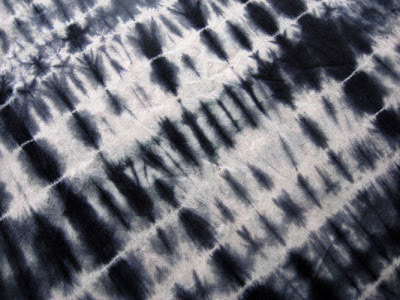 First thing, I'll get a shibori pot going, with one of the four black dyes I now have. I was inspired this week to create a quilt out of fabrics shiboried with all these dyes, and I'll be dyeing one batch at a time. Should be interesting! 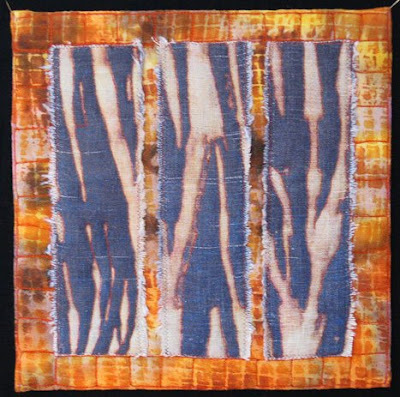 Sunday I'll be going to the Redwood Empire Quilt Guild's biannual show in Eureka. My art quilt group will have a collaborative piece on display, and I can't wait to see what all the fantastic local quilters have been up to these past two years. 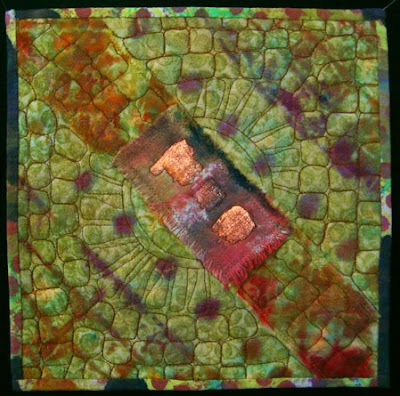 I don't belong to the guild -- I don't do guilds any longer -- and its orientation is toward traditional quilting. 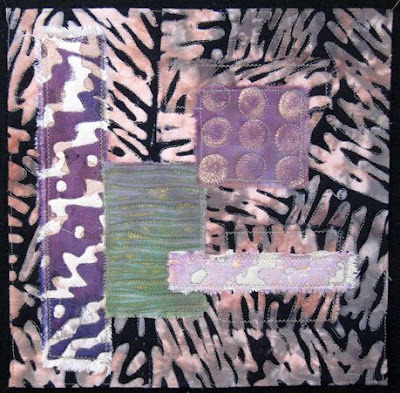 Nevertheless, there's usually a great showing of more art oriented quilts. So it should be great fun! Here's the latest quilt, completed today ~ Lunar Influences, 26 x 23 inches. 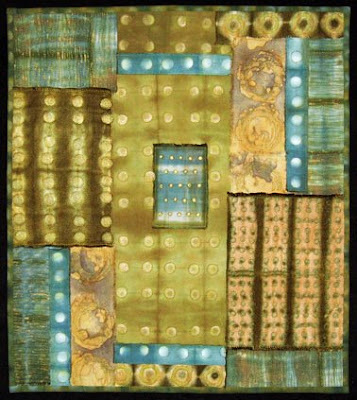 All of the fabrics were shiboried, including the handwoven pieces, except the two rusted and batiked pieces with the organic circles. 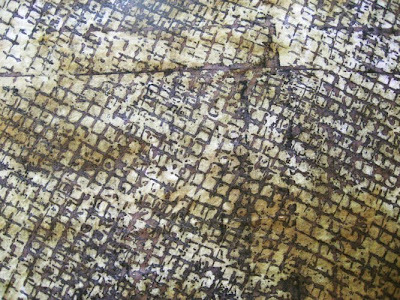 Nearly all the fabrics were also stamped with Lumiere or Setacolor metallic paint. I really love the unusual color combination here. As I lamented on Facebook, my hands are a mess. Somedays they hurt more than other days, usually I just push through it because, let's face it, I'm not going to stop using my hands. The combination of my carpal tunnel with today's intense handwork through high-thread count cotton, though, did a number. I don't usually use Kona cotton, but I shiboried the binding a week or so ago, to match the rest of the quilt, and I used a piece of Kona. 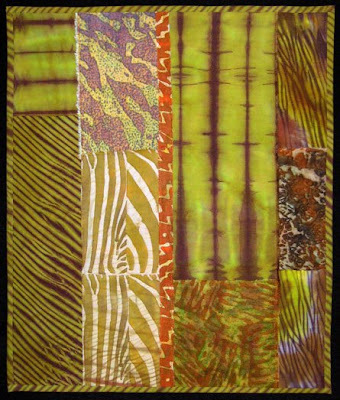 Most quilters that I know love the stuff -- yes, it dyes beautifully. But I prefer fabrics with a softer hand. Which is why I use muslin a lot, and linen. Kona is difficult, for me anyway, to sew by hand. Kind of like high-thread count sheets and pillowcases. Great finding old ones to dye and print on, but not good for handsewing. 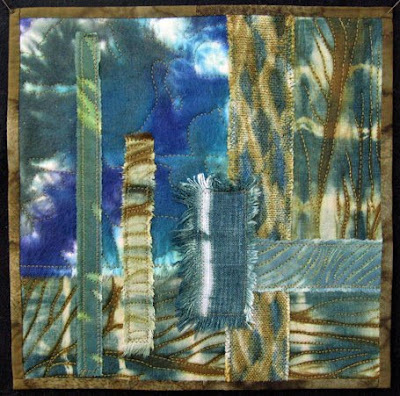 I learned yesterday that one of my entries was accepted into the Foto-Fiber-Fabulous quilt exhibit at Fiber Artspace in San Antonio. Very exciting. I'm actually very stoked that although I haven't been art quilting for very long, I've gotten into just about every show I've entered. I'm really encouraged by that. Sales will follow -- my mantra! I'm experiencing major challenges getting the Networked Blogs widget to work on my Facebook page and profile. Bear with me, please. Thanks! I never had much luck before now using automatic dishwasher gel to discharge fabric. I'm sure that's because I had only been using it on commercial black fabrics. 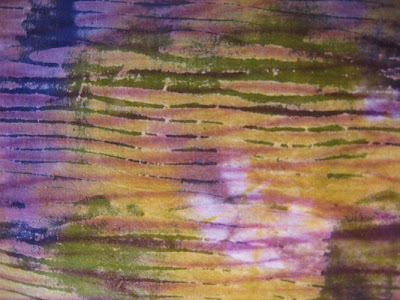 So today I experimented with the gel on recently LWI dyed fabrics and here are some of my results. Some of the most promising, anyway. 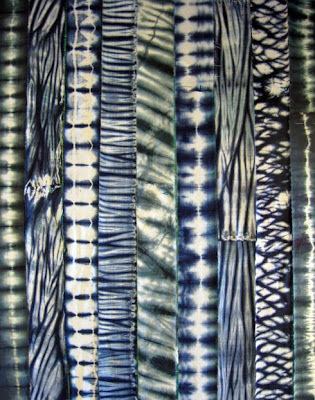 The techniques that produced the best results for me, that I'll definitely do again with more intent, are deconstructed screening, rollering, and the shibori application. Although the stamped discharged images turned out to be one of the best finished pieces in this batch, as I've been discovering over and over again recently, I prefer more organic forms and shapes than multiple stamped images. This piece above is still pretty dark and I intend to do another discharge on top of it. I think I'll add a bit of water -- or perhaps print paste -- to the gel next time I screen print with it, to give the gel enough body to force a good print through. The gel also needs to be thinned to produce good results for shibori, the way I applied it to the edges of a folded piece. I liked what I got today, there just weren't enough discharged areas for my taste. A caveat ~ I'm still not ecstatic about any of these pieces because the colors are pretty strange for me. But they sure provided ample opportunity to try some new techniques, and decide which ones I want to go forward with at a later date. This blog is now being fed onto my Facebook profile via NetworkedBlogs. This is herely a test post to see how it goes. Finally did a low water dyeing process yesterday that was worth the effort. The pic above is one of my two samples of that. This procedure used extremely low liquid on prewetted fabric. In fact, I intend to use even less dye the next time -- although I only used 1/4 cup of dye for a fat quarter. The soda ash was added after about 10 minutes, then it batched for an hour. Quick, easy, very light on resources. And the best that I did all week. This piece I shiboried yesterday over a low water experiment from early in the week. 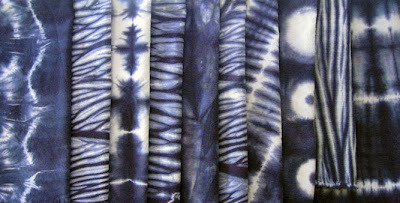 Shibori really helps! 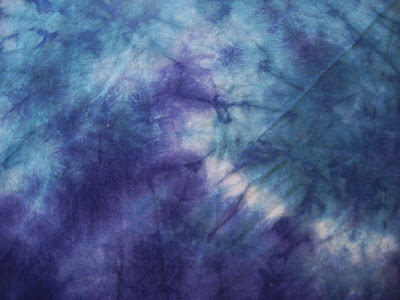 Sometime this week I learned a very important piece of information for using fiber reactive dyes, that I hadn't known about before ~ and now I know why trying to use the dye recipes I've used for years with acid dyes weren't working with the fiber reactives: the primaries need to be mixed in different proportions for fiber reactives. In other words, red is three times as strong as yellow, whereas blue is twice as strong. This applies to any red (including fuchsia), any yellow and any blue (including turquoise). If you were "raised" on fiber reactives, you undoubtedly already know this. But acid dyes are of equal strength, and that's where I started dyeing. So, if I want to recreate an acid dye formula with fiber reactive dyes, and the acid recipe calls for 6 parts yellow, 1 part blue, 1 part red ~ the fiber reactive formula is 18 parts yellow, 2 parts blue, 1 part red. Every yellow part gets multiplied by 3, every blue part by 2, every red part by 1. 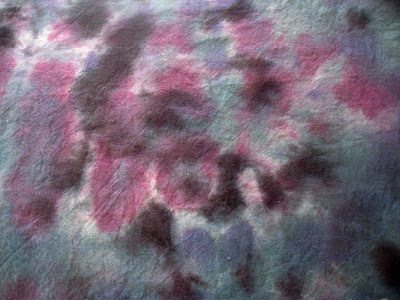 I did this very thing with the dark magenta I used for shibori yesterday, and the resulting fiber reactive color perfectly matched the acid dye swatch. Now I know how to make this work for me, and I have a huge color book of formulas I can recreate. 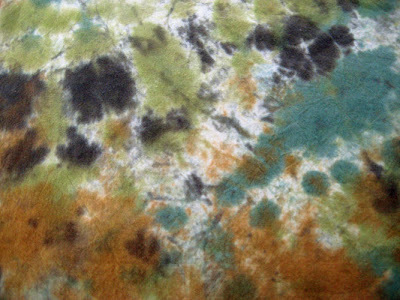 With all the low water immersion dyeing experiments I did this week, I probably dyed 3 or 4 yards of fabric. And in all that, I probably got half a dozen pieces I liked enough to put directly in my cloth stash -- although some of that could be overprinted later. I have one more experiment to do tomorrow, then I'm onto dye painting. 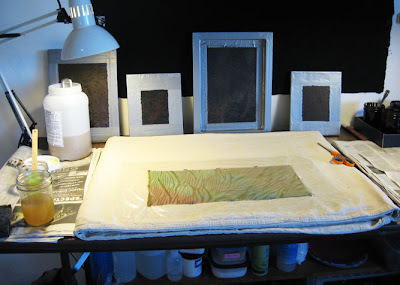 I did more deconstructed screen printing yesterday, and these photos are the results. 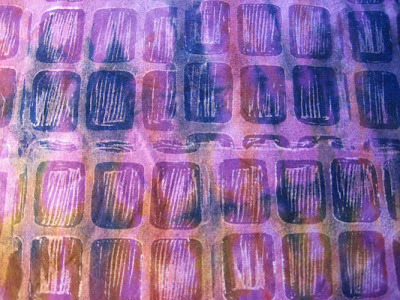 I had a bunch of highly thickened purple and red dye left, which is why many of my pieces recently are printed in purple or red! 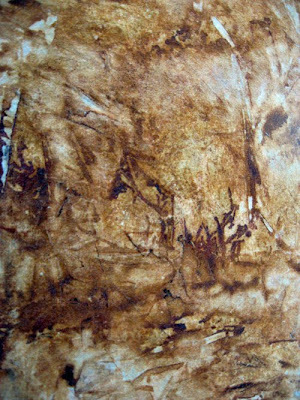 The piece above was discharged a few weeks ago, then I DSP'd it with an earlier screen, then overprinted it this week. This one was DSP'd over a shibori piece -- I'm loving the effect of combining these two techniques. The last one's a killer piece! It's a piece of linen that I DSP'd eons ago with a black screen, which went gray/blue. So I overprinted it yesterday with four prints lined up vertically, then on the edges I used a glue screen I've been working with for a couple of weeks. Tip, if you use the blue glue as a resist on screens, and you want to prolong the life of the screen, wash the dye off with cold water. The glue will stay on the screen. 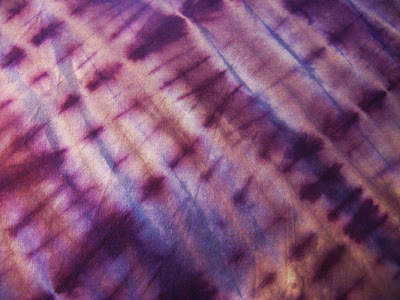 Also up tomorrow, another shibori session, to overdye some of the not-so-great stuff I dyed this week! Will upload photos when they're available. I did two more LWI dyeing experiments yesterday, one turned out better than the other, but I'm still not ecstatic about my results yet. I think my mixed dyes are beyond their life expectancy -- I know they are, as a matter of fact, so I need to remix some before going on. 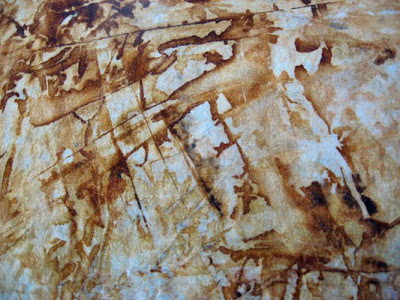 At any rate, I can say for sure that I need to begin LWI with wet fabric (some instructions say to start with dry fabric), because all the experiments I did with dry fabric produced results where the colors were too blended and muddy. I also know for sure that there's definitely a limit to how much dye/water liquid to use -- too much liquid again produces muddy results. One of the methods I followed yesterday said to use several cups of liquid, without indicating how much fabric that would dye. 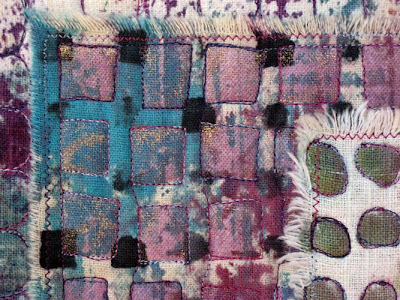 Consequently my fat quarters were inundated with liquid and the colors all mooshed together. So I know a few things now as I go forward. 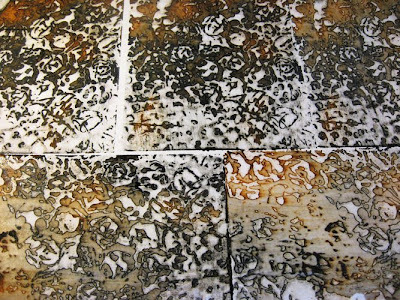 And there'll be more experimenting in the next week or so, including paint-dyeing fabric. 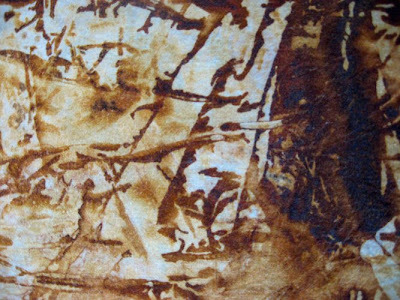 Why I'm doing all this, in the first place, is that I want to create base dyed fabrics that I can print on top of. 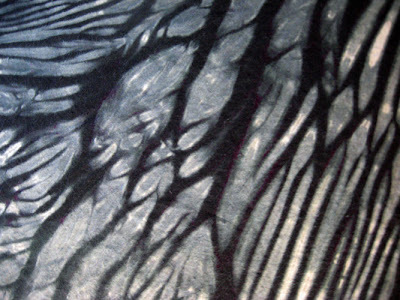 Like I'm doing with some of the shiboried fabrics, deconstructed printing on those and getting terrific results. Anyhow, I just started a Facebook Page -- check it out and become a fan! I'll have photos tomorrow, I promise! This time I wetted the fabric first, squeezed out the water, folded or scrunched and put in little tubs, added soda ash/salt in warm water and let stand for 15 minutes, then added the dye (very little dye, actually), and let them batch for close to 3 hours. Although the color areas were far more distinct than yesterday's experiment, I still haven't gotten the results I'm looking for. So tomorrow I'll try something else. I'm thinking, though, that perhaps LWI just isn't my medium for dyeing fabric. With all the other techniques I'm learning and using, I'll probably just let this one go. But my deconstructed screen printing is really improving, thanks in large part to Kerr Grabowski's fantastic DVD. If you're interested in this process, check out this highly recommended DVD, as well as Kerr's groundbreaking work. I prepared numerous screens over the weekend, and started printing today. The first one was prepared using ice cream sticks. The actual piece looks way better than the photo. The last piece was made with bubble wrap, mostly. I eventually put another couple of layers of print on the piece before it was finished. More of this tomorrow, another LWI experiment, and possibly I'll start basting my next quilt! Before I sign off, here's a photo of my wet work table set up to print. Most folks use something more formal to print on, a padded board of some sort with fabric stretched over it, then the fabric to be printed pinned onto that. What I've come up with is this: the pad-looking thing is a very large canvas tarp that's folded so many times that there are 16 layers here, which provides more than enough padding and a surface with "give." Under my fabric to be printed is a piece of 1 mil plastic that's big enough for the fabric plus extra coverage if the screen goes beyond the edge of the fabric. Using t-pins, I stretch the fabric onto the tarp. After I print, I clean off any excess dye around the fabric, then pick up the plastic with the fabric on it and lay it on the floor someplace to dry. After it's dry, I fold up the fabric in the same plastic, and steam it. I usually steam 8 or 10 pieces at a time this way. I'm ahead of the game this week -- I've already completed this week's quilt, also my July quilt...28/52.2009 ~ Hotter Than July (thank you Stevie Wonder). I had a stack of possible fabrics waiting since early last month, the quilt name already decided back then. The main pieces are sections of a digital print of discharged fabric, and the ground is a handprinted linen napkin (I love printing and quilting those things!). 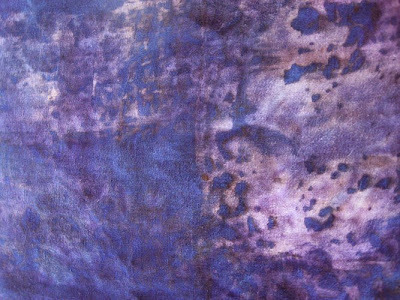 In other studio news, I've been doing low water immersion dyeing experiments again. Everybody has a different way of doing this -- different sequence of when to add the soda ash fixative, different amounts of dye powder per cup of water, different amount of liquid in each container, different lengths of time to batch or fix the dye. So I'm trying to find out what works best for me and produces the results I want. 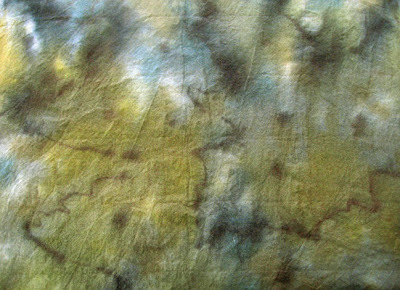 Yesterday I dyed fat quarters of different types of cotton fabric, each piece rolled, folded or scrunched differently. I began with dry fabric, folded, scrunched, etc. and put in small plastic containers, poured different colors of dye over each one (about a cup of dye total for each container), let sit for 15 minutes, added soda ash/salt (1 tsp each to a cup of water), put a rock on each bundle to make sure it was immersed in the liquid, covered, and let stand for 24 hours. I wasn't real happy with the results. Although the colors were very strong, there was little definition in the patterns. Some of the pieces I intend to discharge next time I do that. Two pieces I will print on later this week. Two turned out well enough. Tomorrow my next experiment will be to add soda/salt liquid to the fabric before the dye, which should allow for better color definition because alot of the sites for dye molecules to attach to on the fabric will already be saturated with the soda/salt liquid. I'll also batch for alot less time -- probably just a couple of hours. It's always amazing to me that regardless of how much information there is about how to do things, when all is said and done, we each have to find out what works for us. Because there's no one way to do anything, and innumerable variables to factor into the equation. And everybody's circumstances are just a little bit different. So the personal experimentation is one of the joys of being an artist -- also one of the ongoing challenges! This weekly quilt evoked several different possible names, but I settled on Wasabi. And this is quilt number 27/52.2009. I'm not really satisfied with the colors in my photos right now -- I'm switching from an old version of Photoshop, that began to degrade a couple of months ago, to Photoshop Elements 7. And I'm still trying to figure out how to get the colors the way I like them. These photos should be a little more yellow for my taste. There's no specific slider for yellow in PE7, like there was in my old version of Photoshop. Looks like I have to select a color group in Hue/Saturation, then change the saturation of that. Whereas there are sliders for Temperature (blue to red) and Tint (green to magenta). If any of you know an easy way to adjust yellow in PE7, please let me know! The thing is, I may want to adjust the photo for yellow without changing the saturation. That's what I can't figure out right now. Anyhow, something new to learn! This last photo was just manipulated in the older Photoshop version, and the colors are much truer to the actual quilt than the photos above. I'll have to work on this!